I often treat myself to pre-cut cauliflower florets in the produce section, a huge time saver, and then the only other prep involved is chopping a cup of red onion and a few mint leaves. That’s it. Really! A few tips to streamline this already quick and easy dish. Start by braising (browning) the cauliflower florets in heated olive oil and then add in your red onions. When you start with the onions first, the water content from the onions somehow adversely affects the cauliflower from lightly browning and you end up with kind of greasy, soggy florets so – cauli first! Also, braise florets head down in the olive oil until you can see them lightly browning. You’re just looking for a golden brown. After you add the onions, give the whole pan a quick stir and the sweetness of the onions will cut any natural sulfury-ness from the cauliflower. And it may seem like a bit of olive oil, 1 cup, but it’s key here so don’t be tempted to skimp. And I must HIGHLY recommend using Kyknos tomato paste whenever you can. The name means swan and Kyknos comes straight from Greece. Kid you not, that special Greek tomato flavor is packed into every can. Look for it in your local Greek/Mediterranean market or at our favorite Greek International Food Market here in Boston. Very worth finding! There are, of course, many variations of this dish and our family always makes it with bay leaves, fresh mint and a cinnamon stick. I’ve had it before with coriander and also with celery and really all are wonderful. Once you make this dish a time or two as written here, feel free to experiment with the flavoring yourself. Another plus, you can enjoy braised cauliflower on it’s own with good quality bread, my favorite, or serve over rice for a hearty meal. The recipe yields a small amount of ‘sauce’ and is actually almost as amazing at room temperature so a perfect take-for-lunch option. You will not be disappointed! In 3 quart saucepan with lid, heat olive oil on low – I use 3 on my induction stovetop. Add cauliflower florets, head down, to the pan and cook approximately 5-6 minutes until lightly browned. Add chopped red onion and stir gently. Cook 5 minutes until onions are almost translucent and add water with dissolved tomato paste, salt/pepper, bay leaves and cinnamon stick. Bring up to a low boil – I go to 5 on my induction stovetop. Cover and cook for 15 minutes then uncover, stir gently, add chopped mint, re-cover and cook for additional 10 minutes. Test for doneness, cauliflower should now be fork tender, and cook for 10 more minutes uncovered to boil off a bit of the liquid. Looks fabulous – can’t wait to try it! Oh this looks so nutty and full of flavor. Off I go to the market for cauliflower. This tasted really good! Kiki, I have an important question. I know Greeks like eating maccaroni, can you tell us about some traditional pasta dishes? How would the Greek version of pasta pomodoro (tomato sauce) differ from the Italian variant? Is there a chance we will see your take on pasta, soon? 🙂 🙂 and yes, working on pasta/sauce for next month actually! it was a multi grain bread from local bakery – so good!! I must admit that cinnamon, bay leaves and mint sounded like a very strange combo! was reluctant to try but you talked me into it when you said it was the best! You are right! So addictive! such great flavors (it even impressed my friend from Greece!) i think mine came out a bit soupy-er than was supposed to (maybe my head of cauliflower was too smal for a whole cup of olive oil?) but i just kept adding to it for a few days (more cauliflower, fresh tomato etc) and the main taste stayed. super yuummm! thank you! It was wonderful! I had a bit too heavy of a hand with the salt, but as you said, it was particularly tasty the next morning at room temperature. Just wondering how well this would re-heat. 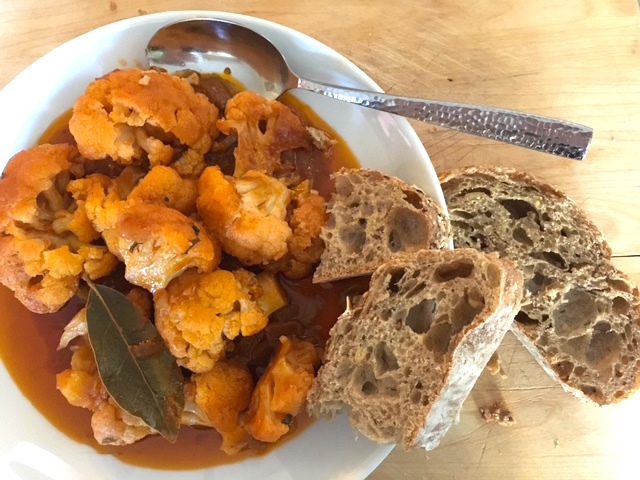 Hubby’s birthday in a couple of days and am planning on baked chickpeas with braised cauliflower for a birthday treat – we both love greek food. However, we are going out first and whilst the chickpeas will cook whilst we are out I will need to do the cauliflower beforehand – any top tips for best way to serve/cook this on a reheat? first off, happy birthday to your hubby! next, your menu selections are excellent! lastly, yes – reheat over very low heat in a covered pot with perhaps a tablespoon or two of water until warmed sufficiently. You don’t want to cook the cauliflower any further as it will begin to break down and go all crumbly. It will still taste delicious but your presentation will be less than – esp for a birthday celebration 🙂 good luck!